OK, so you guys know we don’t do traditional written reviews on this site (mostly because so many people are already doing that), but this is an exception. 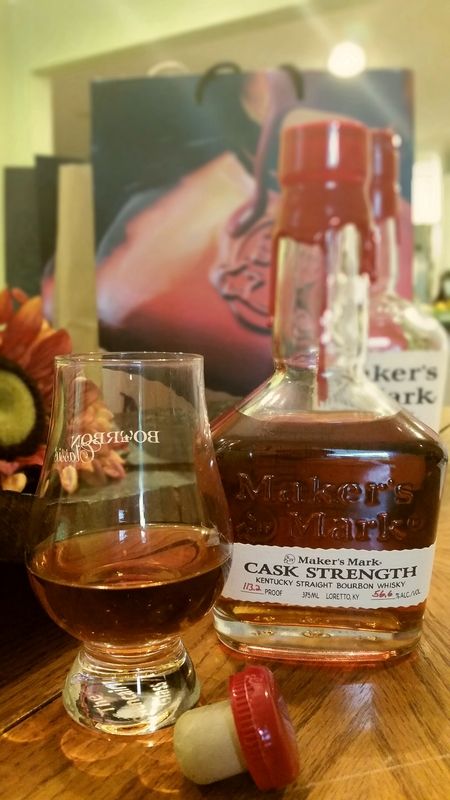 I haven’t really seen anything about the new Maker’s Mark Cask Strength out on the interwebs, and I’ve been excited about it for quite some time having tasted some that ‘fell off a truck’ awhile back. This may be because Maker’s decided to release it with pretty much no fanfare whatsoever and only at the distillery. Either way, I wanted to pass along my thoughts to you guys, and that is as good of a place to start as any to talk about this new release. The best I can figure, the company is viewing this as an ‘isn’t that neat’ attraction at the distillery itself. Sort of like the white dog most places sell but people rarely buy more than once. Maybe I’m wrong, but selling it in a half bottle size and the fairly quiet rollout make me think this may be the case. The plans I’ve heard were that they would release it to bartenders and at the distillery first, and then eventually to the retail market. I have no idea if any of this is accurate, but on the tour I had to specifically bring up the fact that it was being released today because our guide didn’t until it was in front of us at the tasting. They seemed to be upselling the 46 far more than the Cask Strength as well. The price. I knew they were going to sell this in a 375ml format, for the time being anyhow, but I didn’t know it would be $39.99 until a couple days before the release. This is expensive for Maker’s. At an effective $80 for a regular bottle, this puts it up there with premium once a year releases and nearly 4 times as expensive as their flagship. It is what it is I guess, and of course we’re all rushing out to buy it, so I guess it worked. OK, enough blabbering, let’s taste the damn thing. The Color: This looks like good bourbon. Despite its younger age this has a nice deep reddish amber color. It’s got good legs on the glass too indicative of the higher proof. The Nose: Oddly enough, the first thing I noticed was opening the bottle. The wax was so fresh it was still soft and smelled of paraffin. Irrelevant, but cool I thought. As for the whiskey itself, it smells big, and that’s good. None of the usual thin candy shop you get off of regular Maker’s. All the good barrel notes are there (vanilla, toffee, etc), but there’s an unexpected baking spice scent. A little bit of chocolate if you close your eyes and have someone suggest it to you. The Taste: Heavy, sweet alcohol on the front that evolves into nice notes of bitter orange on the top of the palate. Further sips reveal a salted caramel character, with good barrel note filler. Hints of the chocolate that was on the nose, and again that baking spice (allspice/clove). The mid-palate is really the high point of this bourbon, as the finish is of average length with a certain degree of thinness to it. That could be due to the age or the fact that is a wheater. The Verdict: This is good, and if you live within an hour or two of the distillery, I highly recommend you go get some for yourself. It is a little too expensive and a few years too young in my opinion, so I would hold off on the secondary market purchases. Especially if it starts going for as much as I anticipate it will. This is by far my favorite thing that has come out of Maker’s Mark and makes me sad that they have been watering it down for so long. Make it 39.99 for a 750ml bottle and this would become a standard in my bar. As of now, it’s an excellent treat and definitely fun to try. I look forward to seeing how it changes as the bottle stays open. Okay, all this does is make me want my bottle more!! Question, did you get to taste the “over aged” stuff? Interesting that they did not have enough juice to continue bottling at 90 proof just a few short months back. Now they have enough to bottle at barrel strength? Sounds like they discovered some ‘ghost’ warehouses. This is simply great marketing on the part of Maker’s. They will make more money from their bourbon selling 375 ml barrel strength bottles at $40 (or 750ml at $80) compared to their 90 proof 750 ml bottles at $30 (at least in Michigan). The only question I have is what took so long for someone to figure this out.